The Bridge is a delightful indie platformer developed by Ty Taylor & Mario Castañeda that requires you to think in a reality where every wall is also a floor. The Bridge is a delightful indie platformer developed by Ty Taylor & Mario Castañeda that requires you to think in a reality where every wall is also a floor. Our character, a middle-aged professor, spends his time wandering around a world were physics and gravity are the law of the land. The black and white world around him is as simple as it is complicated and the unusual backdrop is inspired by the work of M.C Escher. The aim of The Bridge is to guide our character to a door in each room. However, we are presented with no obvious way of doing so.. That is until you realize every room can be titled to allow the character to move around. We are confronted by many obstacles as we attempt to reach the gateway to freedom. Most notably boulders that roll around as you tilt the world from side to side, should one of these hit the wondering professor its time to use the rewind function. This allows you to reverse time and correct the mistakes of your past. However you can’t completely escape your shortcomings, you are left with a ghostly image to mark your last death. As the game progresses we are confronted with gravity manipulations, gravitational vortexes, parallel dimensions, and many more mind-bending concepts in a world where the laws of physics are not what they seem. If all that wasn’t enough to get your head around, you even need a key to open the door at the end of each level! The learning curve in this oddly addictive puzzler is a gradual and enjoyable one. In fact, the games hardest levels are usual completed by the simplest solutions. The key to progression? Think logically! After you have mastered the games 24 relatively short levels, the fun really starts. With options that really spice up the puzzles, one being a mirrored mode. This really gets your brain ticking. Mastering the controls in this mode can be frustrating to say the least, but this option really adds the longevity to the game you’ll crave. One gripe with The Bridge is it’s somewhat tedious pace, yes I know our tweed wearing companion doesn’t look like an athletic type but I’m sure he could at least manage a jog? The lack of pacey movements makes executing ideas rather lengthy and levels that involve trail and error, more than thinking power can become monotonous. This lead to me finding myself over shooting tilts in my eagerness to reach the ever-allusive door. 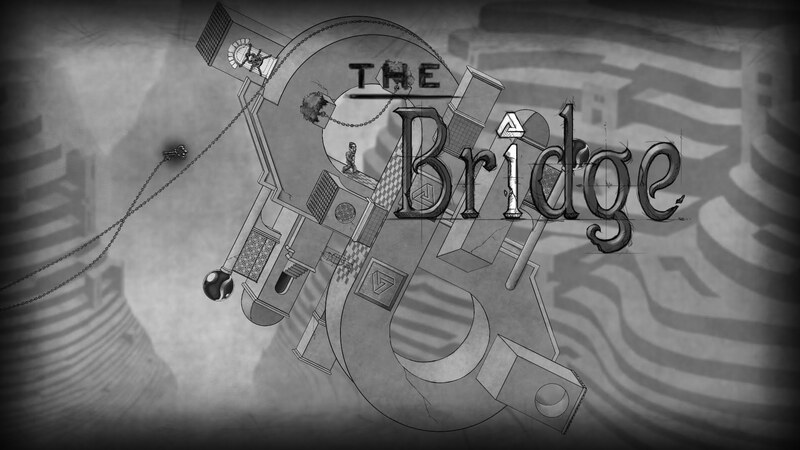 If you’re a fan of puzzle’s or the art work of M.C Escher, and can live with the slow nature of some levels, The Bridge is definitely worth a punt. It’s visuals are stunning, its soundtrack well fitting and its gameplay very enjoyable. Caolan, a Irish lad who currently lives a short drive from Belfast. Has a huge passion for film, gaming and technology. Massive fan of the Battlefield series and FIFA series. Self confess Apple fanboy.